My dad sent me an incredible article last week. Emirates have taken the decision to remove their A340-500 series aircraft early from the fleet. These aircraft are a mere 8 years old and are one of the longest range aircraft in the world. Emirates cannot justify the cost of running these aircraft anymore and have actually written off the value of their depreciation already, this means if they cannot sell them then the aircraft amazingly will go off to the scrap yard. Currently 2 aircraft have been sold and a 3rd has been designated a mothball for spare parts. The advantage that the A340 does have for many operators is that it is not restricted by ETOPs (Extended Twin Operations) this means that it does not have to have special licences or pilots to fly across the Atlantic or the pacific like a twin engine aircraft would such as the 777. Today at 10am EADS answer to Boeings 787 took to the skies, the new A350-900XWB. The sound of the new Rolls Royce Trent engines is something pretty magnificent I think, although its obviously also very quiet! The aircraft will now undergo 2500 flight test hours before it enters service in 2014. There is also a great Airbus Programme that was running live here Airbus Live A350XWB, I am unsure how long it will run for though, it had some fantastic history of Airbus for the first hour and the take off was from 59mins onwards. 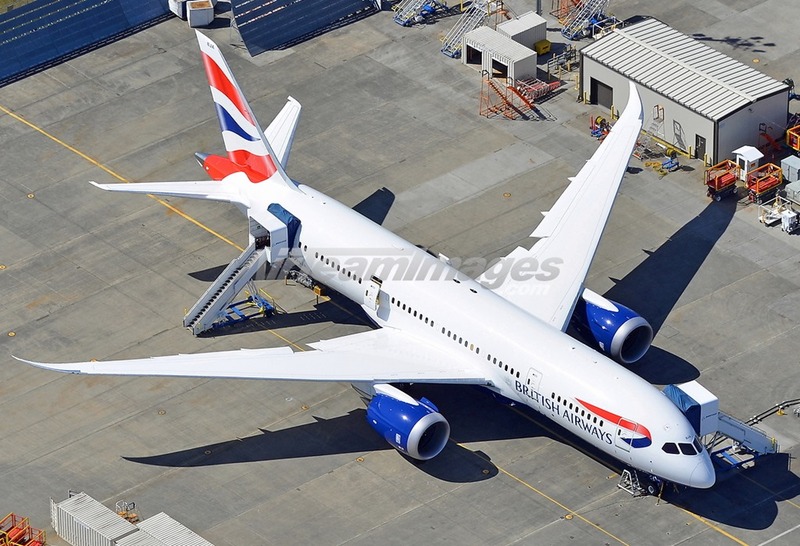 The third of the new BA 787s came out of the paint shop last month and the first aircraft had it’s first flight on the 8th June. 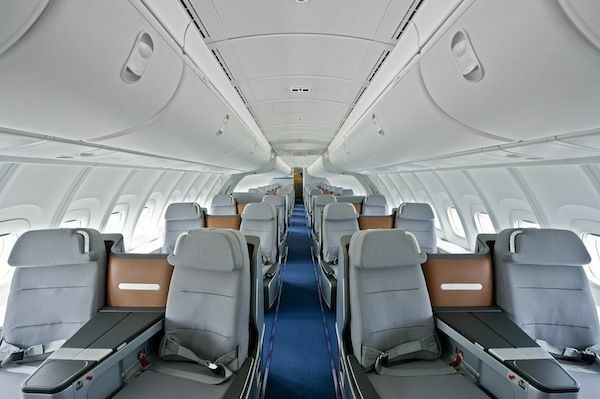 The 787s will come on line in July and will be tested for line training on the Scottish routes, hopefully some Edinburgh and Glasgow routes which I may be able to sneak onto. The crew are currently doing training at Prestwick Airport, British Airways also do a lot of their maintenance for the Airbus fleet there as well as using it as a base for training pilots. The A380s are now under way with flying and testing and will soon be undergoing line training for the BA crew. Both of these aircraft will be delivered at the staggering rate of 1 aircraft every 2weeks for the next 12 months. No this isn’t about the 747-8i, it is about what the likes of KLM and JAL did back in the 80s to make their 747s more like the 747-300 series. this article that I found is quite fascinating as it shows how it was all done in the 80s. 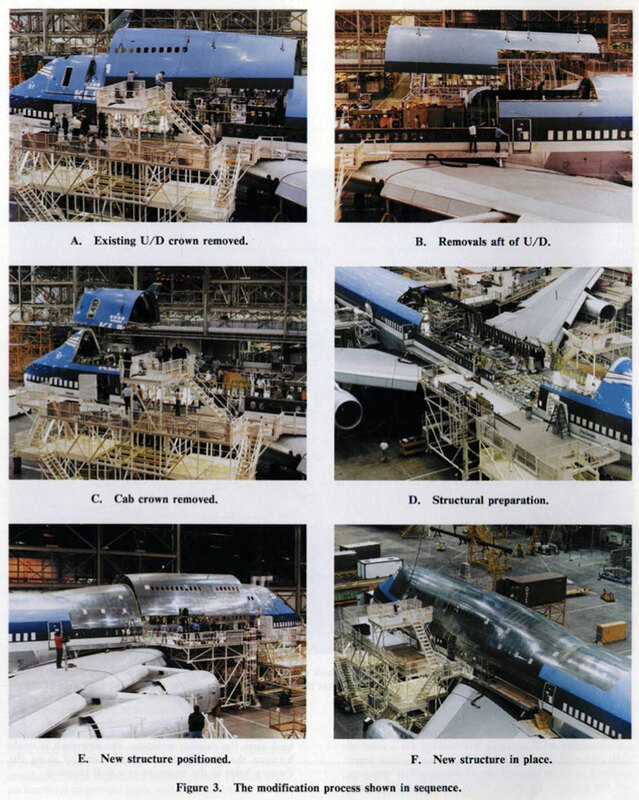 The 747-8i is actually has 2 fuselage plugs fore and aft of the wing, and the wings, engines and flightdeck are quite different. 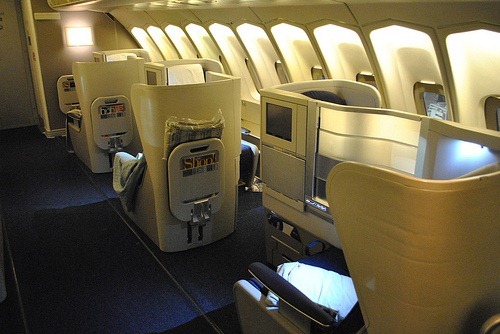 I have actually flown on the upper deck of one of the last 747-300 series that Singapore Airlines had, it was from Manchester to Singapore in 1988, this is also the longest flight I have ever made at 6,815miles. At the time the 747 had the nickname “Big Top” and this was written in big blue letters down the side of it, just coming into service at the same time was the 747-400 series and this had “Mega Top” written down the side of it. 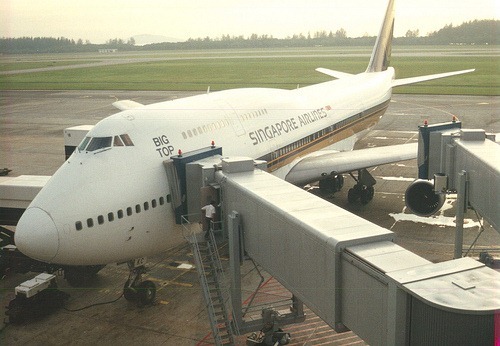 Sadly Singapore Airlines retired their last 747 in March 2012 so it is no longer possible to fly on one of these. 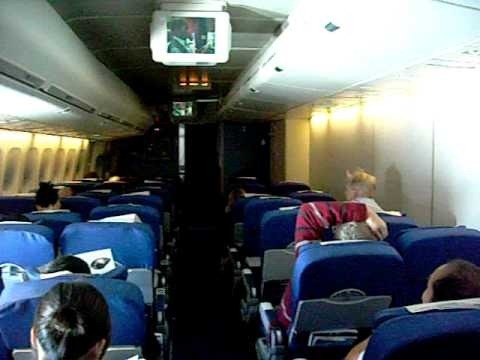 I also flew on one of TWAs 747-200 series from Istanbul to Atlanta, this was during TWAs gradual downward spiral due to a compulsory ticketing discount agreement that was robbing them of $150m a year. 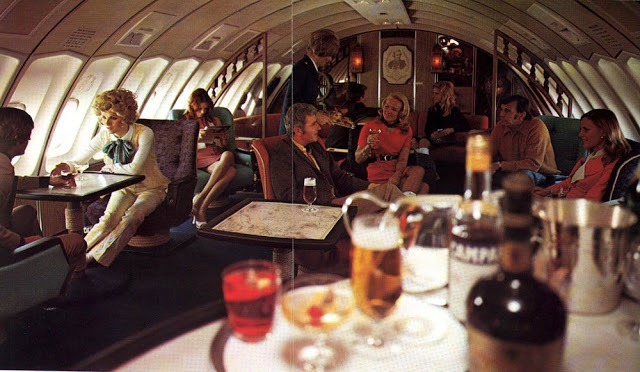 Other 747s I have flown on are British Airways (upperdeck and in the nose) and KLM 747-Combi. 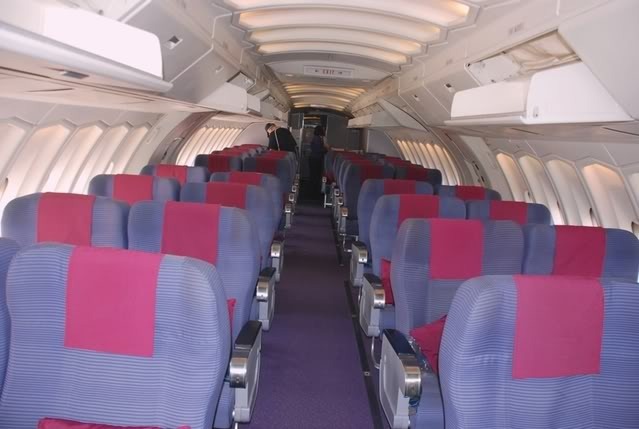 The combi is a great plane to fly on if you nab the seats at the front because they are only 2-2 with then a huge galley, its like being on the upper deck. For me, the seats on the upper deck are the greatest around. 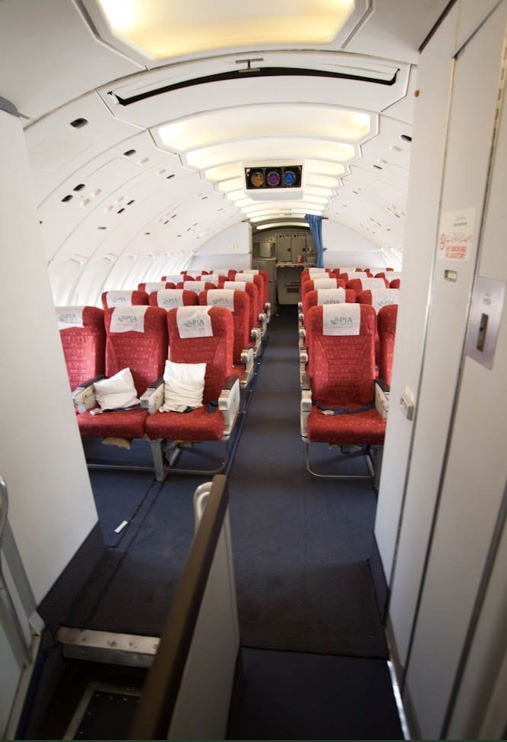 It is so quiet and there is bags of space including a handy locker to the side of you because of the slope in the cabin wall. This evening flying back from Birmingham I was pilot monitoring, it was about 9pm and we were taking a deconfliction service shortcut that I always ask for with a certain Scottish control frequency. As we were passing over the Yorkshire dales there was suddenly a flash of blue-green light that came streaking overhead and then went through the clouds. I had no idea what it was and at first I assumed it was just my imagination. However a couple of minutes later a BA Cityflier aircraft reported seeing the same thing crashing into an area near Carlisle and seeing a burst of flames when it hit the ground. The air traffic controller asked for a speed and trajectory to which they answered "2000kts, south to north", this was possibly accurate with the speed because it did happen quite quickly, it was definitely accurate with the direction and location though. I’m still not sure what it was, I have found nothing in the news but this guy captured it on his onboard camera in his car. There are quite a few articles on the web about it too, seems to be the same colours etc reported. The snow at the moment up on the ski slopes is incredible so my wife and I decided to head up on Friday. We had booked a lesson at Glenshee for the morning which is about 1.5hrs drive away from Aberdeen. We decided to go on Friday because the weekends can be rammed, as soon as all the slopes are open, people flock there in their 1000s and just cause huge queues everywhere which just makes it a miserable experience. Note, online booking doesn’t work very well so you are just best calling up. We left the flat at 7am and it was snowing quite heavily already in Aberdeen. As we passed through the village of Aboyne (famous last year for having 25c for a week at the end of march, followed by a week of snow) the snow was starting to get a bit deeper and there was a small build up of traffic beginning on our way to Braemar. Braemar is quite obviously a skiing and mountaineering village, that’s what all the shops revolve around together with cafes, it is a pretty village though. As we passed through Braemar we hit the snow gates which guard the A93 up to the Spittal of Glenshee and down to Perth, and they were firmly closed. This was annoying because we had checked the webcam before we left and it showed that the gates were definitely open. We had to wait around for a policeman to turn up in his land rover to find out what was happening. It turned out that the road was open but the heavy snowfall had made the road dangerous and the road was supposed to have been ploughed but the snow plough broke down. It was going to be at least 40minuts before the gates were due to open and we were going to be late for our lesson. We gave the ski school a call who were surprised to learn the gates were shut and they postponed our lesson until whenever we arrived. We were half contemplating abandoning glenshee and heaving for the lecht instead, but we figured it would take about that long to get there anyway, plus we might not be able to get a lesson in either. So with that, we did what all good british people do, we sat there in a queue waiting for the gates to open. About 5 minutes later a huge snow plough came past and the gates were opened for it to pass through, this thing was bigger than a 7.5t truck and had a plough on the front that looked like it could charge down a portcullis in a castle. After about 15minutes we abandoned the idea of sitting in the car and locked it up and walked back to the village, hoping that we wouldn’t come back to the gates suddenly being opened up and everyone cursing our car being in the way as the policeman stuck a ticket on it. After some nice warm tea we headed back to the car and waitd a few minutes before the snow plough came back from the Spittal and made a u-turn in a siding. I was hoping the driver was really good at u-turns in this thing because it looked like it could cleanly sweep a few cars off the road without the driver even feeling it. So at last the snow gates opened! A flurry of people were throwing dregs of tea into bushes, stamping out cigarettes, slinging jackets into cars and hopping in to rev up their engines. The policeman did his wave that only traffic duty policeman can do after hours of training, and we all passed by him splashing snow and slush at his feet as we went by. After about 1.5miles through the gate we suddenly realised why they had been shut, the road was not even visible, and this was after the snow plough was making its second attempt to clear the road. The snow was piling down from the sky as well as drifting off the tops of the valley and just covering the road as quickly as it was being cleared. There were 6 cars in front of us, a couple of ford focuses, a mondeo, a Mitsubishi and something else which i can’t remember. I was keeping a very close eye on their driving technique because the last thing I wanted was to be held up and get stuck by some imbecile in front that didn’t know how to drive in the snow or didn’t have decent tyres. For those that don’t know, driving up a snowy incline like this road takes a combination of things to happen all at once, regardless of the tyres you have. The first is that you need momentum, you won’t go anywhere without it so you need to keep your speed up, but not too quick that you lo control. The next thing is you need to be in a higher gear than normal, this is to prevent the engine from producing masses of torque at the wheels and consequently spinning on the snow. After that, you need to do everything much smoother, no jerking of the steering wheel or using the pedal as though it has an on/off switch, you need to gradually feed in any movements you will make and treat the accelerator like it is glass, if you have traction control and it starts flashing a lot, it’s time to back off the power or shift up a gear. Lastly, the choice of route you choose through the snow, it’s no good picking the deep stuff but similarly the compacted stuff is just as bad, you need the broken up slushy stuff to get any grip or look for sections that are very thin and Tarmac is visible. The cars in front of us seemingly chose to do none of these and one by one they tried to bring everyone else in the traffic line down with them like a sinking ship. I chose to use the other side of the road and just keep over taking them, there was no way I was going to be brought to a standstill with the rear wheel drive car, although I did have a last secret weapon which was a set of autosocks in case everything really did go to the dogs. The passengers of the vehicles we passed stared annoyingly at us, particularly the Mitsubishi which was a 4WD and was struggling hopelessly up the snowy hill. Eventually clear of all the idiots on the road, we made the 15 mile journey to Glenshee ski centre and parked the car up, there were about 50 cars there! Excellent news, this meant the lifts would all be queue free :). I have been to Glenshee many times when I was younger, but I have not been back there since about 1995 and I have to say, I didn’t really recognise a lot of it anymore. We grabbed our gear out of the car and got our warm clothes on, the car was reading -4C so it was pretty chilly outside, that combined with the wind and the snow made it feel pretty cold on your face as the snow melted and more icey wind blew across it. We got to the ski school and met our instructor and arranged to meet in another 15minutes once we got our lift passes sorted. The ticket desk were only giving out half day passes because they weren’t sure how long they were going to stay open for and so we would have to come back at 1pm to extend our pass for another £5 which would give us the whole day. Then it was time to meet up instructor. I thought he was going to take us out on the nursery slope and have us doing really basic stuff, but no, we headed straight for the pomel tow to the top of the slopes. I was a little bit worried that I was going to stack it on the lift but the instructor was quite reassuring. It did feel really strange skiing again after some 10years of not doing it. I used to ski quite regularly as my parents lived in Toulouse and we used to go to Andorra and the South of France every year and I was what I would call an advanced skier. Like most sports, my brain remembered what I used to do years ago and thought it could co-ordinate my body accordingly, unfortunately it could not do this at all and instead I had the instructor telling me off for bad habits as I made pitiful efforts to keep my skis parallel. I the end, I gave up and did some snow plough turns for the first few runs, this also allowed both Allie and I to practice the same things and improve our confidence, she had not been skiing for even longer than me, some 20 years so I was really impressed to see that she was so confident going down the, at times, icey slopes. The instructor really helped us to get our body position correct and allow the skis to do the work rather than us hauling the skis about putting stress on our knees. We had borrowed the boots and skis from Aberdeen Mountain Hire and they weren’t the best fit in the world, digging into my calves quite badly, I longed for the perfect fitting boots I used to have in Toulouse but they were long gone. I couldn’t get them tight enough to brace my legs forward and so there was too much play in the boot allowing my calves to lean back slightly and hence my weight shifting back too much – not a good thing with skiing. Once our 2 hour lesson was oer we headed back to the car to get some lunch and get warmed up. Allie had brought some sealskin gloves that should have been ok for the weather but the cold had got too much for her hand and then she experienced the pain that every winter cyclist has gone through – warming up badly cold hands. The poor thing didn’t know what to do with her hands they were hurting that much, I felt really bad that I hadn’t picked up an extra pair of big gloves that would have fitted over the top of hers and now she was in a lot of pain and misery. We needed warmer gloves if she was to carry on in the afternoon and come again on another skiing trip so we finished lunch and got out of the car (which was now a baking 26C) back into the cold, to find ur skis and poles had been buried by the snow that had fallen in the 30mins we had been eating, unbelievable. We dug them out and headed to the ski shop and picked up some really snugly mittens for her before going to extend our passes. I got to the ticket desk and the woman remembered us because allie had her student card, she just gave us the afternoon passes for free which was nice of them, although in fairness, we’d had a lot of the morning wasted sitting down at Braemar snow gates. Back out on the slopes in the afternoon and we had lots of fun in the powdery snow. I have never known the slopes in Scotland be so perfect, there was hardly any icey patches and we had the slopes practically to ourselves all the way down before getting straight on a lift at the bottom and doing it all over again. Now we were left to go straight down the runs and straight back up the slopes we found ourselves improving with nearly every run we took down. We decided to stay off the red and black runs for a couple of reasons, but mostly because we found we were improving just nicely on the blue and the green runs, and with the powder snow it was really enjoyable and relaxing. Even when I was a great skier I didn’t really like the black runs, they were just so much effort I didn’t see the point, besides they were always full of idiots who thought they could ski it but couldn’t and instead just created obstacles for everyone else to avoid or guess where they were going as the skiers themselves clearly had no idea. At 1530 we decided that we would call it a day, we probably only had another half hour of decent light left and we could already see lots of people pushing their cars out of the car park because of the foot of snow that had fallen during the day, it wasn’t worth the risk being one of the last people there and no one around to push us out. We packed all our stuff up and helped push a Saab out of the space next to us as well as a Corsa which just couldn’t move at all. It wasn’t looking good and I contemplated fitting the Autosocks onto the rear wheels. The big irony of these was that because of the snow that had fallen and the wind had picked up and the amount of snow/ice the arches had picked up, it was too difficult to wrestle the things on. I gave up and just brushed all the snow off the car instead before getting back in and hoping. I just lifted the clutch slowly and allowed the drive to gradually ease power to the wheels and crawl out of the space. Amazingly the car just moved forward and out of the space, straight out of the car park and onto the A93, I think the guy in the Audi Q5 opposite us was a bit miffed because he was having a few attempts to get out. Another win for the winter tyres. We dropped our gear back at the ski place in Aberdeen on the way home, we didn’t actually have to return it until the next day but we were passing it anyway and picked up a few ingredients to make some home-made pizza, it seemed a perfectly appropriate way to finish off the day.